If Facebook is truly the web’s largest referrer and search traffic is no longer growing, then that’s a sea change with massive implications for the entire digital marketing industry, resulting in serious shifts in strategy, resources and budget allocations. Yet BuzzFeed seems to be the only primary source reporting this upheaval. As the search consultants of record for some of the biggest publishers in the world, we decided to dive into the metrics ourselves. The data we examined suggests something entirely different than the data BuzzFeed is distributing, and which publications like Re-Code and The Atlantic are uncritically amplifying. Define Media Group is an audience development consultancy and one of our primary objectives is SEO. We are the agency of record for many of the Blue-Chip publishing networks world-wide with access to tremendous amounts of referrer data. We utilize this information to identify valuable trends, problems and opportunities. According to BuzzFeed their data gathering is done via a tracking code across their network of sites of which “represent an audience of more than 300 million people globally.” They use this tracking code to come to the conclusions above. What’s also important to understand is that by analyzing the Omniture and Google Analytics data directly, we’re looking at the same data that publishers use to make key business decisions. 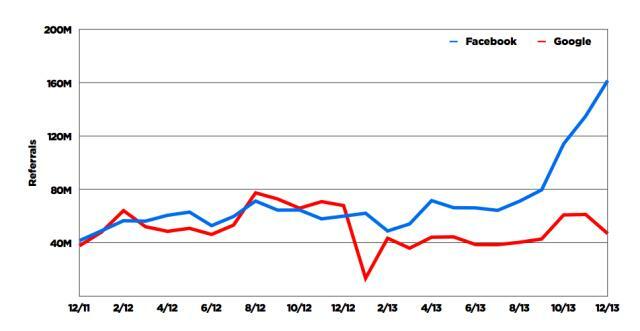 To our knowledge, none of our clients use BuzzFeed viral tracking data as a mission critical internal reporting tool. The numbers above do not reflect the Dark Google issues which plagued publishers for most of last year, which we’ve covered extensively. In essence, taking the fact that most mobile search traffic was incorrectly attributed as “direct” for the majority of 2013, the search numbers above should actually be even higher than we’re reporting here. It’s no surprise BuzzFeed’s network and methodology is obviously biased towards more socially oriented publishers. However it is irresponsible to make emphatic claims based on a biased methodology, and it’s even more irresponsible to report on this information without truly understanding the data and the industry which has seen massive flux in the past 24 months. Not only is organic search alive and well, but it’s more important than any other external traffic driving source. We would be remiss as digital marketers to not recommend growth opportunities to all our clients and have done just that. Thankfully this isn’t a zero sum game and smart brands understand that mindful allocation of resources, not the flavor of the month, is integral to success. BuzzFeed is, at the very least, guilty of incorrectly interpreting their data and at most, producing self-serving marketing-driven spin which blurs the line between sales and accurate reporting. Despite repeatedly stating they don’t need SEO, their organic search ranking (and one can assume traffic) continues to grow steadily. This kind of consistent, rapid success would be impossible without an ongoing, attentive and ambitious SEO strategy. (Full-disclosure: The Atlantic approached Define for consulting services in 2012 however we didn’t end up working together.) While they may not care about SEO in the sense that many people think of SEO as some mystical voodoo of keyword stuffing and link buying, don’t think for a second BuzzFeed’s very smart team did not address SEO best practices when building their site and producing content. While it may not a primary driver for their business, they have investors and business goals that are not going to turn away the abundance of organic search traffic they have earned via the engines. While social can curate in the short term, organic search curates and organizes web content for the long term. As such, the search engines would be negligent not to better understand the social graph and social signals. As we often remind our clients, in the big picture, organic search is a pretty accurate scoreboard reflecting all the things you do online and offline. As Danny Sullivan said this week in his article about Search CEOs; “Search is a money-maker. 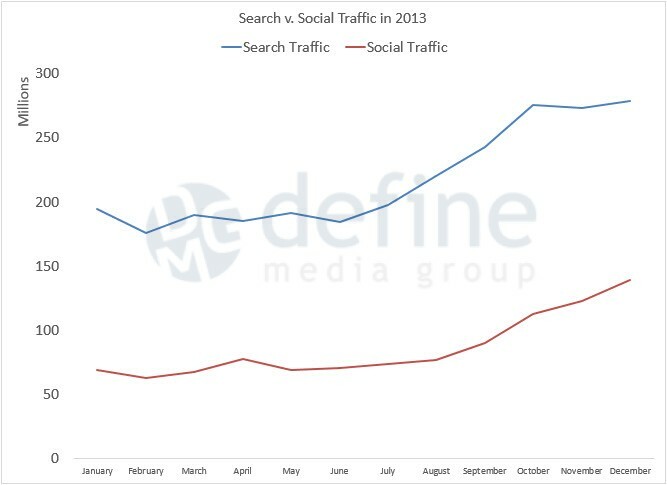 It’s not as cool as social, where so much of the attention is these days, but it’s the dependable product that, done right, can lead to huge profits.” 2014 is already showing stronger search traffic growth than last year and the savviest brands fully understand the essential composition of search and social traffic – and are investing their resources accordingly. Marshall Simmonds is the Founder of Define Media Group, the enterprise SEO company specializing in enterprise search marketing and strategic audience development. In addition to what Marshall states in the post, what people that write about social don’t seem to consider is that Social is limited by your reach. If I don’t follow BuzzFeed on Facebook, I’m not going to see their headlines; same goes for Twitter (unless it’s retweeted) and other social platforms. Search is not limited in reach, therefore the cost of new acquisition is much lower. For publishers that are most likely making money based on CPMs, cost of acquisition is extremely important. New eyeballs are important. Each publisher has a critical mass in social. The number is definitely different, but I know that I personally will NEVER follow BuzzFeed on Facebook, but if I search and one of their pieces of contents shows up, I’ll likely at least take a look. Sites that understand this – whether publishers or ecommerce – often will be able to better maximize revenue by maximizing internal and external resources dedicated to each channel. Is it possible that the type of website will have an impact on whether search or social plays a more significant role? 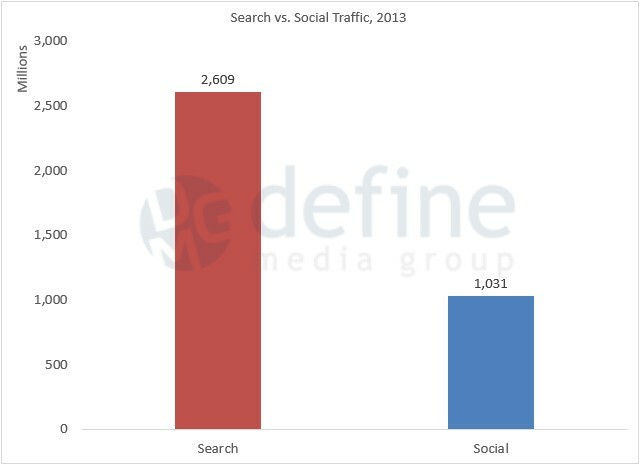 I would imagine that there are plenty of websites that search is significantly more important than social will ever be. However in our case, Pinterest is becoming exponentially more important and valuable everyday. Since our store sells items that are based upon “visual stimulation” so to speak, Pinterest is a perfect fit. And even though I had big hopes for Facebook, it has never offered us the same type of return on investment that Pinterest has. I think it really boils down to who your core audience is, that will determine the importance of either. And to take it one step further. I think you have to take in to consideration that different social platforms will perform at different levels depending upon what you are offering. Personally for us, search and social are both important. However search will always be the overall winner for the long term. Is it possible that Buzzfeed wants to throw people offtrack? I agree Jeremie, Even I believe in choosing those, which best suits for your business or concern. Every business needs to have different strategies and therefore need to choose different platforms. Our company deals with different clients’ projects and have different strategies for all. I saw many companies who handle specific platform and are doing well. Also, I believe that in the initial process, it’s difficult to judge which strategy works and which don’t. Even in our business Google Plus and organic search are the key to bring traffic as well as exposure for our business. Excellent post! SEO is difficult and requires continuous attention to numerous small details in a fast-changing environment. This really means that there is no “easy button.” No matter how loudly the nay sayers shout I agree that done right SEO still delivers and delivers and delivers. It is not a flavor of the month, and those who chase flavor of the month don’t really even want to admit that SEO works, because it means so much work. lest we forget, BuzzFeed’s #1 goal is to create controversy for clicks. Great article Marshal. I have a small company and I have closely monitored our traffic for years and I don’t see the Facebook traffic really growing. I find it hard to believe that search traffic is threatened in anyway by Facebook. It seems to me that it’s kind of like Google vs Facebook is like the Democrats vs Republicans, if they say this we’ll say that, forget the facts because if we say it loud enough then people will believe it. i think another important thing to consider when comparing traffic sources like this is the quality of that traffic. Search traffic can convert very well. People are looking for an answer or solution and finding it via a search engine. Social traffic is when users are bored and browsing their Facebook or Twitter feed, and clicking on a link just to ‘check it out’. There is no real intent. 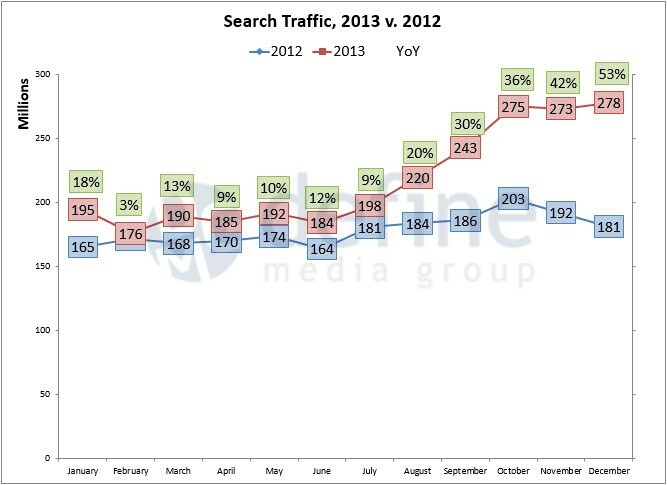 So not only is search traffic still much more popular, it’s also much more effective. It’s hard to rank high enough for the right words to get lots of traffic on Google, but anyone can get social traffic. My blog had about 10,000 visits from Google search last year and 25,000 from Reddit. Does that mean Reddit drives more traffic than Google? To my blog, yes. But that’s all the data supports. If I ranked #1 for all the keywords I’m relevant for, then I bet Google would blow Reddit out of the water. Great stuff here from Define. Thank you. I have not seen anyone mention the fact that BuzzFeed relies heavily on paid social in its social promotion engine. I did not see that they broke the referrals for FB in to Paid vs. Organic. This may very well be an Apple to Oranges comparison anyway. Thanks again Marshal great work. From my experience with the very, very high traffic PR7 site that we run, social media traffic is quite low compared to search. 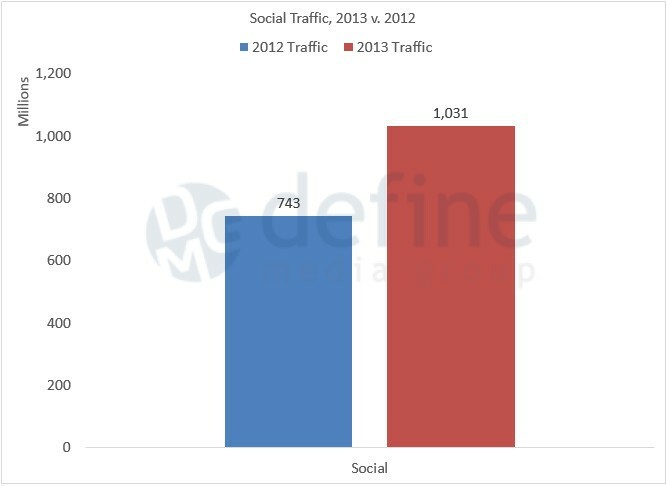 Social media only amounts to about 1% of total traffic. As an SEO practitioner who works in the trenches, day after day now for over 14 years….this is truly NOT news to us – but the fact that a well-known firm like BuzzFeed would report this as fact is the real item of interest…and yes while our own tracked client roster numbers are much lower, we too would agree that organic search is like at least 2.5 times greater referral wise. Thanks for this considered article – I realise that Define has its own agenda re. 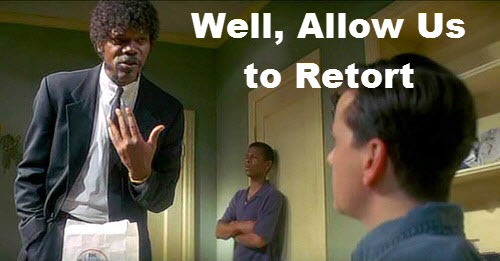 SEO but your analysis and conclusions seem logical. As Cormac Scanlan says, those of us without access to large data sets rely on companies like yours to do this sort of analysis. I’ll be interested to see if Buzzfeed respond – I suspect this debate is far from over. I’m sure it’s over, the Buzzfeed article made no sense then, and even less now. Define deals with the biggest and best whereas we have no clue other than the sites included had 300 million users….hmmm that should result in more clicks than 65,000,000 uniques a month. Posts that use data that is skewed or biased (how do we know what the 300M users are made up of they could have all been social media experts). I am skeptical of much I read when it come to info like this. Search engines have inflated clicks for years. I think the only agenda here is to set the record straight with a REAL DATASET! Despite of all the praises for search traffic we must also not neglect the fact that social helps in retaining visits and developing a lot longer brand impression that is also one major portion in direct and brand searched traffic. I’ve yet to dive back into the organic search, but this article was just plain funny to say the least. It was funny in the sense that someone even attempted to make the claim. If you want to be a social marketer, then be a social marketer. There is a lot of potential for growth, but like Marshall is say here – it’s only short-term. Social above search, pass me that can of gasoline. Great post w/ really good data crunching. I’ve been fortunate enough in my career to play a significant role in hundreds of online marketing deployments – from tiny brands to the enterprise. While traffic is an important metric, conversions rule the roost. Consistently, over the years, I’ve found that non-branded search traffic converts at 1%, at best. On the other hand, branded organic traffic converts at 3.5% at best. The best I’ve seen social convert is 3%. 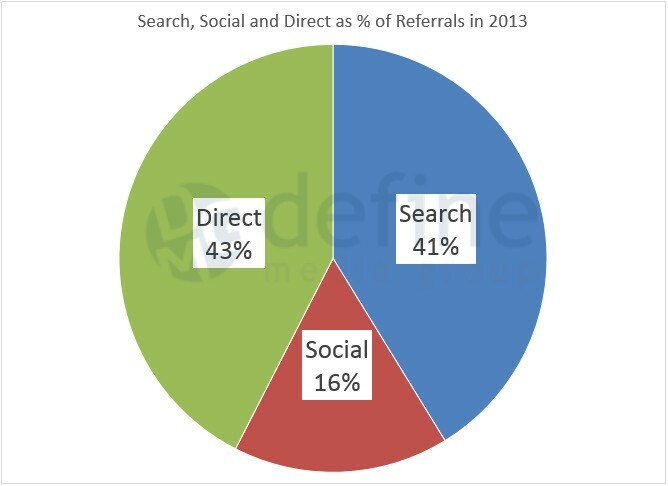 On the other hand, referral traffic converts between 15 to 30%. As a business, the best bang for my buck is always real earned media referral traffic IMO. Would love to see this analysis for conversions rather than traffic. Can you go to that level on your analysis? It would be an epic post. Great stuff here, though I find it incredible that you had to go to these lengths to debunk what was clearly biased reporting, whether accidental or purposeful. There’s a part of me that just wants to whistle and let others think these things while I keep my head down and do good work for my clients. Because I too see similar statistics across my client base, albeit it’s only 5 billion visits and not 10 billion. And while Facebook is a strong contributor for many, it is rivaled and surpassed frequently by Pinterest. To me, the evolution of social contributions and the actual value of those contributions (again quite good for the latter for a few sites) is far more intriguing. Social referral is very important (and becoming ever more so as you show), but you’ve hit the nail on the head here. Buzzfeed may get a lot of traffic, but they are a sample size of 1! Thanks for taking the time to put together (and sharing) such a great retort, methodically researched and generally excellent! As someone who doesn’t work for an agency (never mind a large one) I don’t have access to anywhere near the breadth or volume of data you do. As such, I found this a really useful validation of the trends I’ve seen on a lesser scale.